Digital POS displays are a fantastic tool for marketing and advertising. 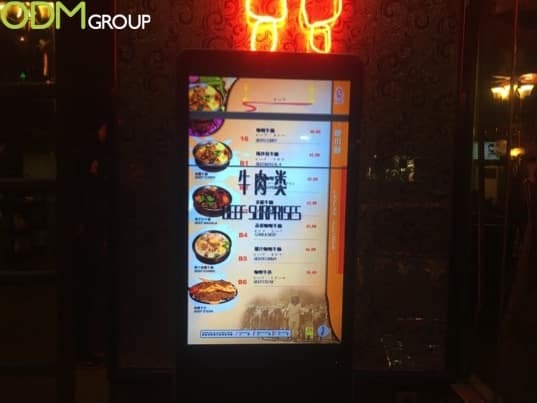 Here is a brilliant example of a touch screen digital menu on show in Zhuhai, China. This can be applied to your restaurant chain! This particular pos display allows the user to browse through the menu via a tall touchscreen high-res display. Clean and Simple UI. This digital pos doesn’t try too hard to be innovative. It uses an easy to the eye user interface, aligning with the hard copy menu and overall brand themes. Large and tall. Small un-receptive pos displays aren’t the best. This is a superb example of how to do it right with a bold sized screen. Position. Situated directly outside the restaurant this is is a great way to attract and grab the attention of potential diners. High quality images. The restaurant include high quality images within the digital menu ensuring they support their dishes effectively. No matter what industry your brand belongs to there are many ways to integrate and benefit from the use of a digital pos display. Whether used as a method to stand out in store, as an on premise display or used within events marketing you can be sure that digital pos display will help generate some positive brand awareness. We have significant experience in product design, product sourcing and product manufacturing. At ODM we can help you utilise your 2016 marketing budget . Contact us to find out how we can help. If your interested in gift with purchase, or a POS display we have comprehensive and ever-expanding portals dedicated to this on our website.